Our wallpapers are perfect for creating a unique statement for any room, helping you turn a dull and plain space into something extraordinary. With a range of exquisite designs, decor and successful collaborations with a few reputed international brands; we have more than 300 wallpaper designs. We aim to provide a holistic yet aesthetic look to the Indian market catering to homes, commercial projects, retail outlets, hotels and restaurants. From simple print wallpaper to the most detailed wall mural wallpaper designs you will find the perfect pattern to fit your individual taste. If you just can't find that perfect pattern, we also offer the service of creating a custom wallpaper for you. What makes our wallpaper services stand apart from the rest? Wide variety of wallpaper designs available. There is something for everybody. Refer to the FAQ’s below if you have further questions on the procedure, designs, customization etc. What is more durable, paint or wallpaper? Both are equally durable and last for almost the same time. The paint film develops cracks, the wallpaper begins to show the seam joints as it gets older. Both do no last in presence of dampness on the walls. Usually the life good quality paint is 7-8 years and the wallpaper can last for the same duration. The great news is that you don't have to choose - paint and wallpaper work well together. Painting a room and adding a statement wall is a great way to add personality and interest to your home. Wallpapers tend to be more expensive than paint, so usually people use more of paint and less of wallpaper. Wallpapers cost nearly or more than interior texture paint on a per square feet basis. Wallpaper offers some great advantages - it can add texture and colour to a room. It can cover minor wall imperfections. Modern wallpaper is easy to care for and washable to an extent. Also wallpapers being manufactured come in hundreds of designs and patterns, more than those offered by texture paints. Compared to texture paint, wallpapers are easier to fix and remove. All wallpapers come in rolls of approximately width of 3 feet and length of 20 feet. So one wallpaper roll will cover approximately 55- 57 square feet considering overall wastage's. So if you have a 10 feet X 10 feet wall, you will need two rolls. Yes, you can on certain types of wallpapers. 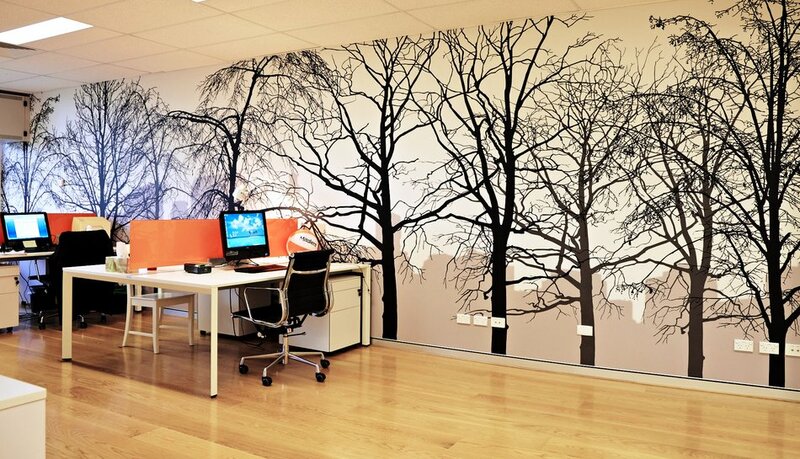 Berger Paints has paintable wallpapers that can be stuck on the wall and painted in your desired colors. These wallpapers can be painted for a maximum of two times. You can fix the wallpaper; paint it in a particular color for three years. For the next three years,you can paint it over with a different colour. Do I have to use special paint to paint over my Paintable wallpaper? No. Any water based emulsion (plastic paint) can be used to paint the wallpaper. Painting is done the same way as a wall would be painted. After painting, the texture of the wallpaper is more enhanced. What must I do to prepare my walls for wallpaper? Proper preparation ensures that your wallpaper adheres correctly to the wall. If the wallpaper hasn’t formed a good bond, it may peel or fall off the wall. Proper preparation work includes sanding of the wall, applying leveling putty, sanding the putty and applying a coat of solvent based primer. How should I remove old paper? While removing wallpaper it is recommended you get a professional to remove it. Old wallpaper is removed by soaking, steaming and using solvents. Can I apply a new wallpaper over an existing wallpaper? What is a wallpaper pattern match? Most wallpaper will indicate the pattern match on the back. A random match wallpaper is the easiest to work with. This means that the strips of wallpaper may be hung together without worrying about the pattern matching up at the seams. A vertical stripe wallpaper or random texture wallpapers are good examples of random match patterns. A straight match wallpaper matches across the wallpaper, or in other words it matches the pattern from the other side of the strip. A Drop match wallpaper has a design that matches up across strips both vertically and horizontally. A professional wallpaper applicator will be seamlessly able to match your chosen pattern of wallpaper so that it looks complete on your wall. You can see the wallpaper at our shop located on Shop no 40, Brahma Majestic, NIBM Road. ﻿You can select a wallpaper from our available catalogues and we shall quote you the per roll charge for the wallpaper as well as the fixing by a professional. If your wall needs wall preparation before wallpaper, we can get that done too. What is the difference between wallpapers and wall stickers? The size. Wallpapers come in standard rolls, whereas wall stickers usually come in pieces of 4,8,16 and 24. Wall stickers need to be assembled and stuck onto the wall, to form an image and pattern. Wall stickers are usually available in patterns of comic characters and are a great idea to liven up your kids room.